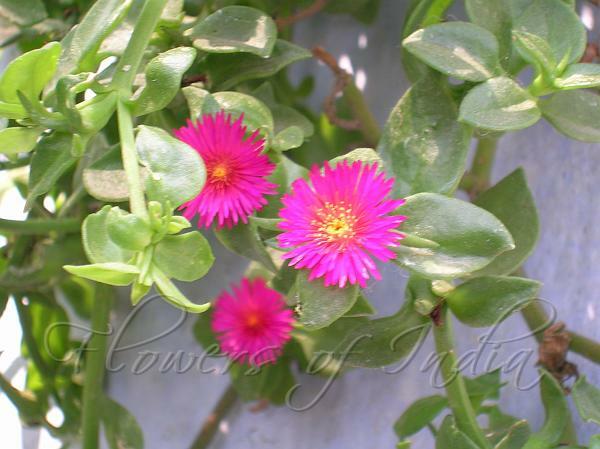 Baby sun rose is a perennial herb, spreading over ground and neighboring vegetation, with small, heart-shaped, dark green succulent leaves interspersed with small, axillary, many-petaled, bright pink to purple flowers that open only in sun. Baby sun rose is native to the Eastern Coastal Plains of South Africa. This charming plant makes an excellent annual ground cover, often reaching a spread of 2 feet or more in the growing season. Baby sun rose needs full sun to light shade. When grown in pots, the pots should be at least 8 inches deep. It also makes a great hanging basket plant for full sun. 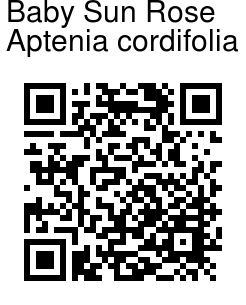 Aptenia cordifolia are propagated by cuttings or seed. Cuttings will root in about 3 weeks. Has excellent heat tolerance.